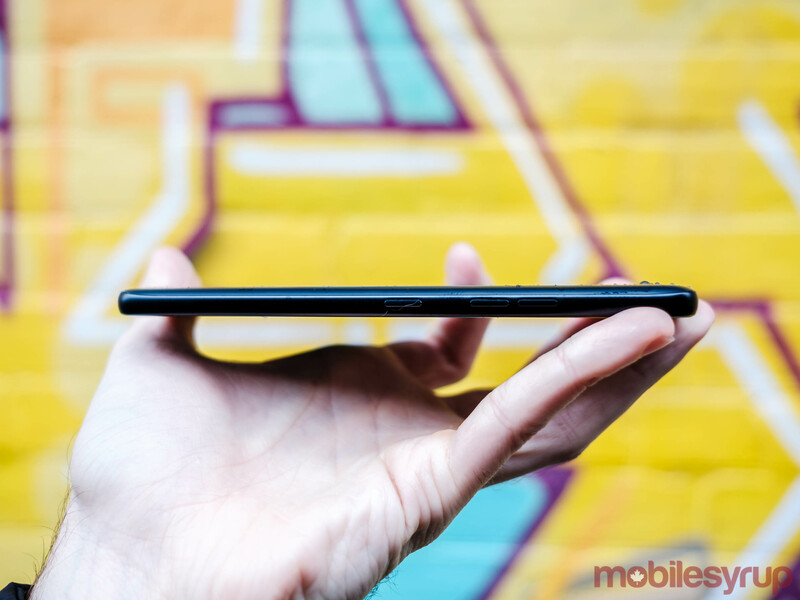 When LG first announced that it planned to bring the G7 One — a pared-down version of the G7 ThinQ that features stock Android instead of the company’s UX skin — to Canada, I had high hopes it meant the addition of another OnePlus-like option to the Canadian market. There’s no shortage of ultra high-end options available to Canadian consumers, but phones like the OnePlus 6T that offer an impressive feature set at a reasonable price are almost non-existent. With smart compromises, the G7 One comes close to fulfilling that promise. However, sometimes when it comes to a consumer electronics product price is everything. And with the G7 One, the price of the phone, both outright and on contract, is everything for all the wrong reasons. It’s a shame, too, since there’s so much to like about the phone. Full disclosure: this review was conducted using a pre-production G7 One unit provided to MobileSyrup by LG Canada using a Fido SIM. As I mentioned at the start of this review, the G7 One is, for all intents and purposes, a stripped down version of the G7 ThinQ, a phone LG released earlier this year. In practice, this means it trades some of the G7 ThinQ’s more premium features to try and hit a more accessible price point. The differences start with the G7 One dropping the mirror-like finish of the G7 in favour of a less extravagant matte finish. That’s not to say the G7 One looks any less premium than its counterpart. In fact, there’s an understated elegance to the new design that’s not present with the G7 ThinQ. New finish aside, the G7 One is more or less a physical carbon copy of the G7 ThinQ. It even features its sibling’s dedicated Assistant button. Press it down once and Google Assistant will launch. Press it down twice and the camera will launch and jump straight into Google Lens mode. It’s possible to disable the Assistant button, though there’s currently no option to rebind it to quickly access a different part of the phone’s functionality. Another borrowed component is the G7 ThinQ’s notched 6.1-inch LCD display with QHD+ 3,120 x 1,440 pixel resolution, 18:9 aspect ratio and a maximum brightness of 1,000 nits. Just like it was on the G7 ThinQ, the display on the G7 One is a major highlight of the phone. Text and icons are tack sharp. Some might not like the display’s muted colours — and unfortunately, there’s currently no option inside the settings menu to adjust the phone’s colour rendering. That said, even without being able to adjust how the phone handles colours, they look realistic and life-like. Moreover, with HDR10 support, the G7 One’s screen is capable of getting extremely bright. Like its sibling, by default the G7 One caps outs out at a brightness of 800 nits. A boost mode, accessible via the notification shade, pushes the display to its maximum 1,000 nits of brightness. With boost mode as an option, I was always able to easily see what was on the One’s display, even in direct sunlight. This makes the G7 One into an excellent device for consuming video content. In fact, beyond the testing I have to conduct when reviewing a device, I typically don’t use my smartphone for extended media consumption. With the G7 One, however, I found myself watching a lot of YouTube videos and the occasional Netflix movie and series. That said, if there’s one issue with the G7 One’s screen, it’s that it is an LCD panel. LCD screens are typically less power efficient than the newer OLED standard. Moreover, like other smartphones with LCD panels, the G7 One doesn’t feature always-on or ambient display functionality. In one instance, I was able to deplete the phone’s battery to 60 percent after four hours and 55 minutes thanks to two hours and 10 minutes of screen time. During that day, I had the display brightness set to 50 percent throughout. One thing to note here is that even at 50 percent brightness, essentially 500 nits, the G7 One is brighter than non-HDR10 compliant smartphones like the Pixel 3 and OnePlus 6. Relatively speaking, the G7 One’s battery performs admirably given the circumstances of the phone’s other hardware: modest 3,000mAh battery, previous generation chipset and a display that’s both bright and dense. In absolute terms, however, the G7 One was outperformed by almost every other mid to high-end smartphone I tested this year. If you use the G7 One’s screen sparingly, it’s possible to get something approaching all-day battery life. On most days, however, I found it was necessary to top up the phone’s battery at some point in the afternoon to ensure that it had enough reserve power to get me through a particularly long day at work or a night out with friends. What makes the G7 One’s battery situation worse is that the Canadian model doesn’t ship with inductive charging — it’s a feature that’s only available on the U.S. model. Moreover, the G7 One supports Charge 3, instead of Qualcomm’s newer Quick Charge 4 and Quick Charge 4+ technologies — this despite the fact that its Snapdragon 835 chip is technically capable of supporting Quick Charge 4. Both of the latter two will top up a device’s battery faster than Quick Charge 3. As such, the G7 One is neither the most convenient nor the fastest smartphone to charge. Another less than stellar aspect of the G7 One, and where LG really tried to drive down cost, is that it features limited storage. At launch, the G7 One is only available with 32GB of internal storage. It’s possible to add additional storage by inserting a microSD card into the G7’s combination SIM/microSD slot. However, it’s a shame the G7 One has so little storage when one of the joys of using it is that it includes a headphone jack with Hi-Fi DAC. Without adding an SD card, I wasn’t able to download my entire Spotify library in ‘very high’ quality. Of course, it’s possible to get a 32GB to 64GB microSD card for not a lot of money, but it still adds to the cost of what is supposed to be a budget-friendly device. Another area where the One pares back on the ThinQ is with its camera setup. The phone doesn’t include the dual rear-facing camera array of the G7 ThinQ. Instead, it features a single lens, forgoing the addition of a wide-angle lens. For some, a wide-angle lens, which allows one to capture more of a scene in a single shot, is one of the major reasons to buy a LG smartphone. Personally, I’ve always found LG’s wide-angle lenses subpar, so the fact the G7 One didn’t include one wasn’t a negative for me. What’s important here is that the G7 One features the same main camera as the G7 ThinQ. It’s a 16-megapixel camera with f/1.6 aperture lens and optical image stabilization. That said, for better and worse, the G7 One also doesn’t ship with LG’s standard camera app. Instead, what it comes with is a bare-bones affair. Post-launch, LG says it will update the camera app to include the “AI Cam” feature it launched alongside the G7 ThinQ. Besides built-in Google Lens integration, which allows you to tap on an object inside of the frame to activate Google’s visual search functionality, there’s little in the way of notable features here. 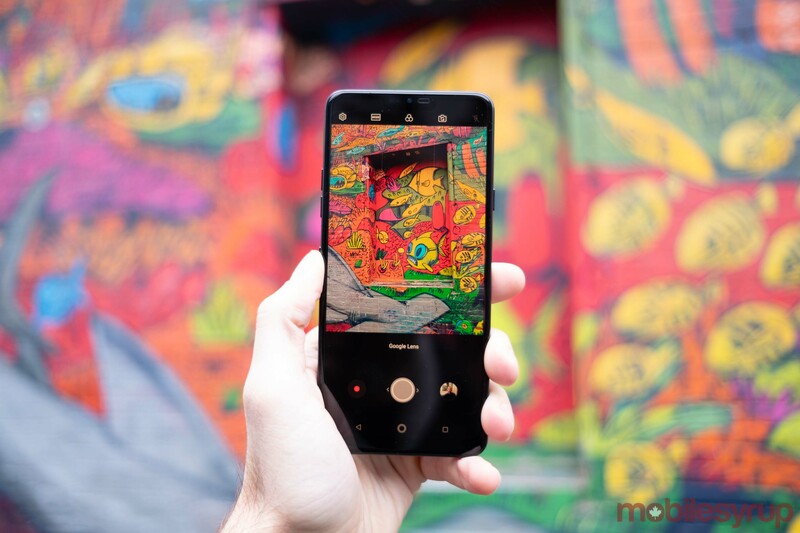 Moreover, here’s where the pre-production nature of the G7 One review unit MobileSyrup tested makes it hard to say anything definitive about the G7 One’s camera; it’s clear the camera app that came with our review unit wasn’t ready for consumer use. To illustrate: the G7 One ships with a pixel binning feature that activates when light is limited. In theory, this functionality is supposed to help when taking photos at nighttime and in settings like dimly lit bars because the sensor is able to combine multiple pixels together to collect more light with each one. When you enable this feature in the camera app’s settings menu, the G7 One informs you that there will now be a toggle in the main interface to activate this feature manually. Similarly, there’s no way to manually toggle HDR capture from the camera app’s main interface. However, the underlying software is generally solid. At least in its current iteration, the G7 One’s camera app takes natural looking photos. It doesn’t attempt to oversharpen images, nor does it oversaturate them. Colours, particularly skin tones, look pleasing and life-like. Moreover, the camera generally does a good job of metering and exposing shots. That said, I did notice it had a couple of weaknesses. To start, like a lot of smartphone cameras, the G7 One has trouble properly adjusting white balance in indoor shooting situations. As a result, when taking photos indoors, most shots will come out either too warm or too cold. Another issue is that in attempting to properly expose low-light shots, the G7 One can sometimes lean too heavily on its optical image stabilization. In these situations, photos come out looking smudged. Lastly, dynamic range — the camera’s ability to capture both the darkest shadows and brightest highlights in a single shot — is definitely a step behind what I’ve seen on other phones. Even with HDR activated, the G7 One has a tendency to blow out the brightest parts of a scene, leaving little detail in those areas of the photo. That said, overall I was consistently surprised by how well photos turned out, particularly in challenging low-light scenes like a restaurant with moody lighting. By no means is the G7 One’s camera the most capable on an in-market Android smartphone, but it gets the job done. It’s also possible to overcome most of its faults with manual camera adjustments and some post-processing. To reiterate what I wrote at the start of this review and in this section, I tested the G7 One’s camera using a pre-production unit. 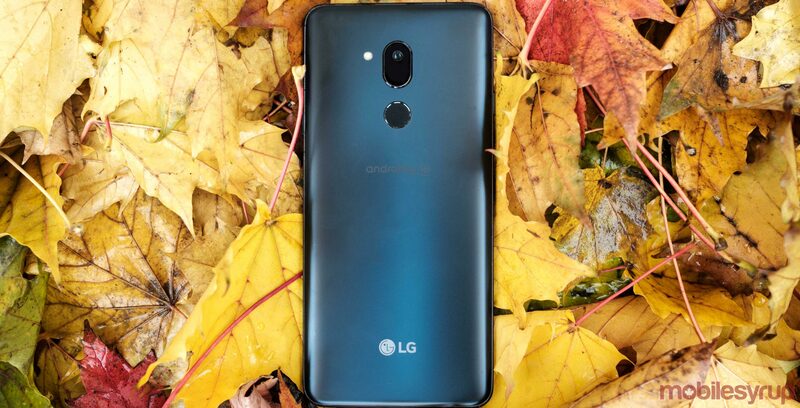 In the past when MobileSyrup has reviewed LG smartphones using pre-production units and then later tested a production unit, the latter has always taken better pictures. The last notable way in which the G7 One differs from the G7 ThinQ is with regards to its software. Instead of shipping with a version of Android that LG has added its UX skin to, it’s an Android One device that features a stock build of Android 8.1 Oreo. In short, the G7 One offers a significantly different software experience from LG’s other phones. With the G7 One, LG is promising two major Android platform updates, plus three years of security updates. Moreover, it’s the first smartphone LG plans to update to Android 9 Pie. At a surface level, LG’s software promise with the G7 One is compelling, especially if you ever had to contend with the sluggish pace at which the company has updated its past devices. What somewhat diminishes the G7 One’s software proposition is that LG’s promise of two major platform updates includes Android 9 Pie. That is, beyond the current version of Android, G7 One owners can only expect to get Android Q. 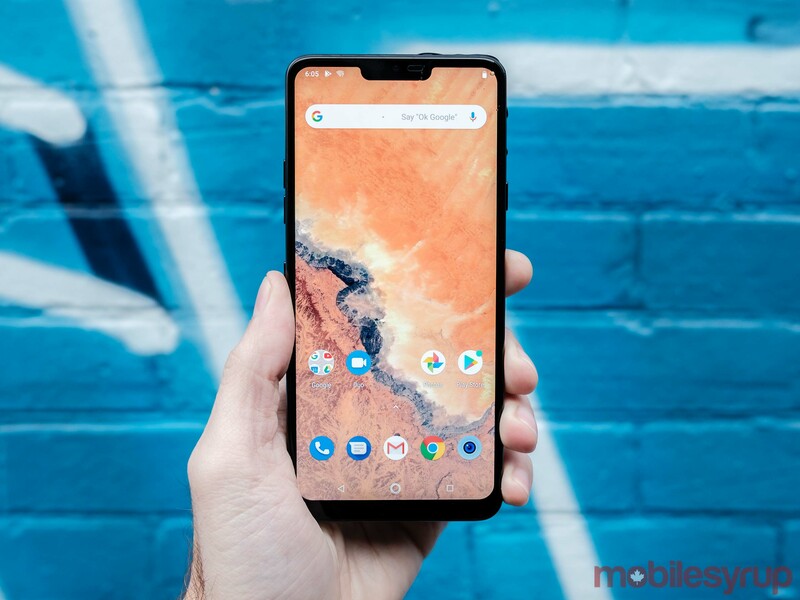 For what it’s worth, LG says it will update the G7 One to Android 9 Pie before the end of the year, which means that beyond the Pixel lineup, the Essential Phone and the OnePlus 6/6T, the G7 One will be among the first smartphones in Canada to get the latest and greatest version of Android. What’s more, the G7 One doesn’t ship with any manufacturer or carrier bloat. Overall, the G7 One’s minimal software makes its a pleasure to use. There’s none of the cruft and odd user interface decisions that characterize LG’s other Android devices. With last year’s Snapdragon 835 chipset and only 4GB of RAM, the G7 One isn’t as fast as speedsters like the OnePlus 6T and Pixel 3, but it’s still a mostly fluid experience. With a price tag that ranges between $800 to $900 price outright and a stock Android experience, the G7 One is going to get a lot of comparisons to the OnePlus 6T. Thankfully, it’s also a useful comparison to make. Internally, the OnePlus 6T features Qualcomm’s current top-of-the-line chipset, the Snapdragon 845. Additionally, the base model 6T ships with 6GB of RAM and 128GB of internal storage. OnePlus also sells 8GB/128GB and 8GB/256GB variants of the 6T. For the purposes of this comparison, I’ll ignore those models since the only way to get more storage with the G7 One is to take advantage of its microSD expandability. It’s also stuck with 4GB of RAM. Another advantage of the 6T is that it features a battery that is, in terms of capacity, 23 percent larger than the one found inside the G7 One. The 6T has other advantages when it comes to battery life. To start, it features an OLED display with a 1920 x 1080 pixel resolution. Both the panel type and lower resolution of the 6T’s display help make it more power efficient. Similarly, the 6T’s Snapdragon 845 chipset is more power efficient than the G7 One’s 835. Between the 6T’s larger capacity battery and more efficient components, running out of power is something you’ll not have to worry about. When I reviewed the phone earlier this fall, I was consistently able to get all-day battery life with eight-plus hours of on screen time. What’s more, the 6T features one of the best fast charging solutions on any Android handset. Similarly, from a performance perspective, the 6T is the far more capable device. In both benchmarks and moment-to-moment usage, it runs circles around the G7 One. The 6T also slightly edges out the G7 One in terms of software. At the time of writing this review, the 6T ships with Android 9 Pie out of the box. Moreover, Given the timing of the 6T’s release, OnePlus is more than likely to update it to Android R. The same is not true of the G7 One. However, where the G7 One fares far better against the OnePlus 6T is that it includes a lot of the features that have been missing from OnePlus phones for a while now. While neither phone includes inductive charging, what the G7 One does have is IP68-certified water and dust resistance. 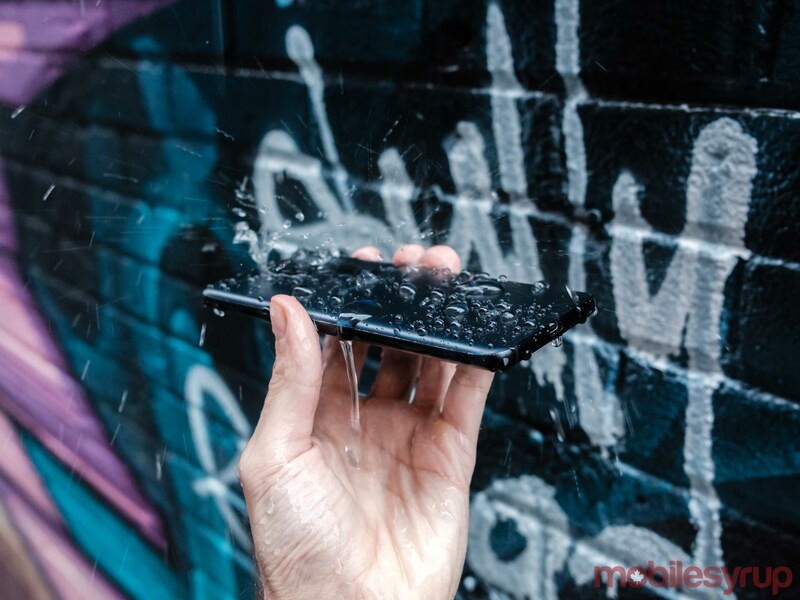 To be clear, the OnePlus 6T does have some form of waterproofing, but OnePlus has so far avoided putting one of its phones through the necessary testing and certification to earn an official water resistance rating. Moreover, while it may not be as efficient as the 6T’s OLED panel, the G7 One’s LCD screen is sharper, brighter and includes support for HDR10. It also has an analog headphone jack and high-quality DAC. More intrusive notch aside, when it comes to media consumption, the G7 One is enjoyable to use in a way that the OnePlus 6T is not. I don’t think one phone is necessarily better than the other. Rather, they’re better at different tasks. That said, even not taking into account the 6T’s lower starting price, its specific combination of hardware makes it seem, at least by my estimation, like the much better value proposition, which is a shame because the G7 One offers something different from the 6T. If cost is the most consideration with your next smartphone purchase, the only situation in which I would recommend the G7 One over the OnePlus 6T is if putting up the $719 it costs all at once isn’t feasible. By virtue of the fact that almost every carrier in Canada is offering the G7 One through a device subsidy, LG’s new phone is the more accessible of the two. Even then, however, buying the G7 on contract is likely to turn out more expensive in the long run given that getting any sort of device subsidy entails taking on a monthly tab and losing the opportunity to hop between promotional plans. It’s hard to overstate just how much it feels like LG has missed the mark when it comes to the G7 One’s price tag. 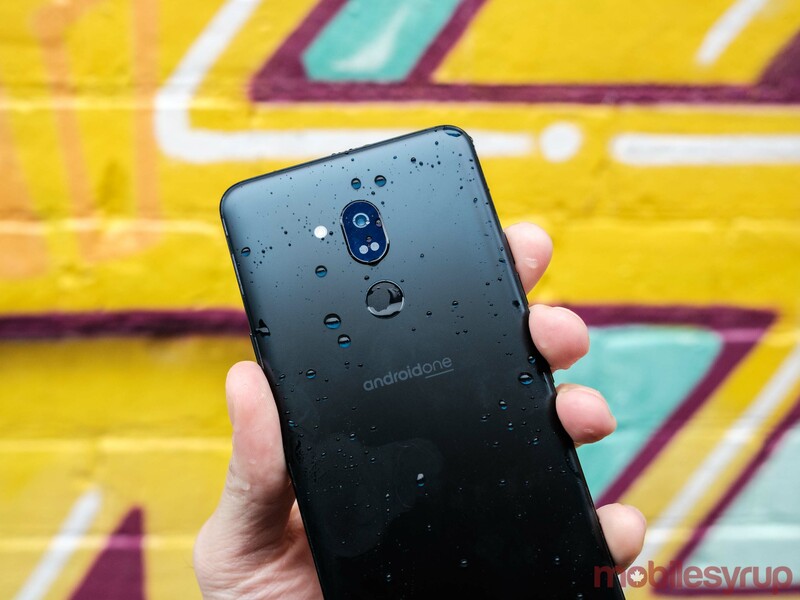 Had it come in at about $600 upfront, The G7 One would have been a no-brainer option for Canadian consumers looking to buy a smartphone with great features at a reasonable price. Instead, its current price tag makes all of its compromises, which in the context of a more reasonable price would have been brilliant, seem like far too much. That said, it’s easy to see a near future in which the G7 One gets discounted. In that situation, it’s very likely it will become this year’s Essential Phone. That is, a smartphone that may be far from perfect, but that finds a niche after a discount. Until then, pick up the OnePlus 6T instead. 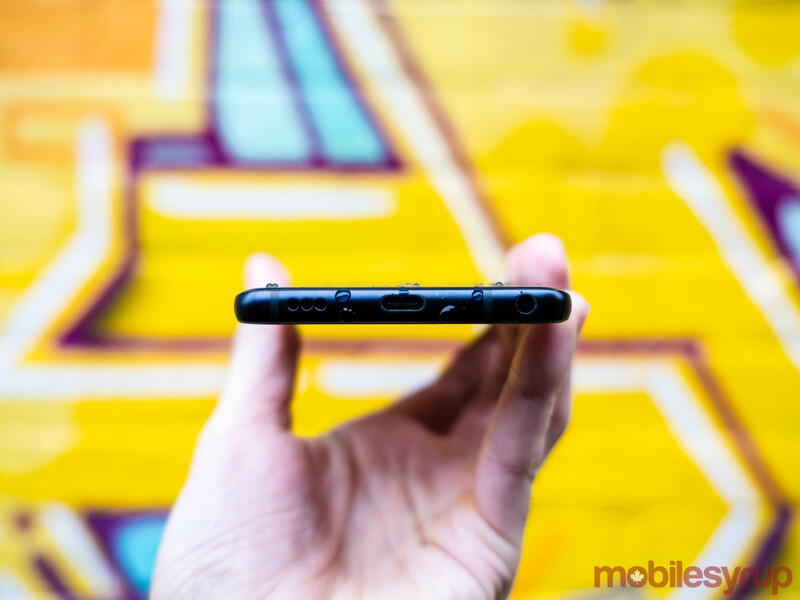 "Had it come in at about $600 upfront, The G7 One would have been a no-brainer option for Canadian consumers looking to buy a smartphone with great features at a reasonable price."